This gluten-free, low-carb and Whole 30 compliant dish is a perfect weeknight meal when you don't want to stand over the stove cooking dinner. 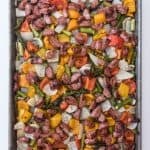 Once all the ingredients are chopped and tossed together, you just spread them in a baking pan and roast them for thirty minutes! One Pan Roasted Peppers, Onions, & Sausages is a healthy and versatile dinner, and your whole family will love it! Heat oven to 450 degrees. Line a cookie sheet with parchment paper. Chop the onions and peppers in even, bite-sized chunks. Drizzle with olive oil and toss to coat, then add garlic, salt & pepper, and sprinkle with seasoning. Toss again to coat everything evenly, then spread around the cookie sheet in an even layer. Roast the onions & peppers for 15 minutes in the oven, then remove and add the pre-cooked Aidell's sausage chunks around the pan. Return the pan to the oven for an additional 15 minutes, or until the vegetables begin to look roasted and caramelized around the edges. Serve with zucchini noodles or pasta and your favorite marinara sauce. This can be made with uncooked Italian sausage if you prefer or have a hard time finding the Aidell's sausages. Just add the uncooked sausage at the start of the cooking process and roast the whole pan of ingredients for the full 30 minutes, or until the sausage is cooked through and the vegetables soften and take on a roasted and caramelized look.